Creamy chicken sausage and spinach pasta – When you can pull a dinner like this one together in under 30 minutes with only ingredients you have in your fridge/freezer and pantry (and without butter OR flour in a creamy sauce! ), how could you possibly go wrong?? Isn’t always the way that on the nights where you feel the most frazzled and you literally throw a meal together on a wing and a prayer, you feel the most satisfied? Full bellies, no take-out, and a slightly emptier pantry and/or fridge is always a great combination, isn’t it? 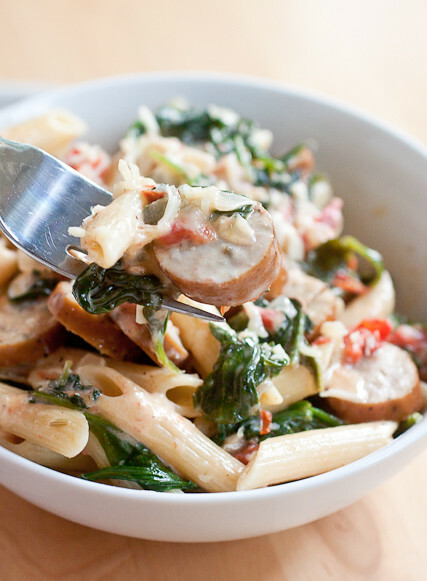 That’s the kind of night this creamy chicken sausage and spinach pasta meal was borne out of. And it was so good that I had to remake it within a couple of nights just so I could actually write the recipe down. The things I do for you! It’s a super simple combination of some sauteed onions and garlic, a white wine-deglazed pan, diced tomatoes, chicken sausage, and fresh spinach mixed in with some pasta. I suppose you’re looking to further bulk up this creamy chicken sausage and spinach pasta, add a rinsed and drained can of white beans. I’m sure some beans would be excellent here too! What really elevated this dish though, was the addition of mascarpone cheese. Seriously, why use cream when you can use mascarpone?! The mascarpone kept the sauce on the thicker side without needing to create a roux at the beginning – and thus saving time and cutting out butter and flour from the ingredient list – or having to reduce the cream at the end of the cooking time which is always a painstaking wait for me when I’m starving for dinner. All in all, this was a perfect dinner for us with lots of leftovers for weekday lunches! I’m certain you’ll love it, too! I used pre-cooked chicken sausage in this recipe so it really only takes a couple minutes of warming in the pan before it's ready to eat. If you use fresh/raw chicken sausage, saute the links until cooked through then slice and add the slices to the pan with the spinach. Cook pasta according to package directions; reserve ½ cup of the pasta water and then drain. Meanwhile, heat the olive oil in a 12-inch skillet over medium-high heat. Saute the onions with the salt for 5-7 minutes, until they start to soften. Mix in the oregano and garlic; cook for 30 seconds, until fragrant. Deglaze the pan with the wine, scraping the bits from the bottom of the pan. Stir the tomatoes, reduce the heat to medium-low, and simmer for 8-10 minutes. Add the sausage and spinach to the top of the mixture and cover the pan for 2-3 minutes to allow the spinach to start wilting. Start stirring the sausage and spinach into the mixture and recover for another minute. Once all of the spinach has just wilted, stir the mascarpone and Parmesan into the pan until melted and creates a creamy sauce. Stir the pasta into the mixture until well-coated with the sauce. Stir in up to ½ cup of the pasta water if the sauce seems too thick. Serve hot. I used pre-cooked chicken sausage in this recipe so it really only takes a couple minutes of warming in the pan before the sausage slices are ready to eat. If you use fresh/raw chicken sausage, saute the links until cooked through in some olive oil in the pan first, transfer to a plate, and then start the rest of the recipe. Slice the sausages and add them to the pan along with the spinach. To stretch this meal a little further, add a can of rinsed and drained white/cannelini beans at the same time you add the tomatoes to the pan. Cook pasta according to package directions, reserving ½ cup of the starchy pasta water before draining. Add the sausage and spinach to the top of the mixture and cover the pan for 2-3 minutes to allow the spinach to start wilting. Start stirring the sausage and spinach into the mixture and recover for another minute. Once all of the spinach has just wilted, stir the mascarpone and Parmesan into the pan until melted and creates a creamy sauce. Stir the pasta into the mixture until well-coated with the sauce. Stir in up to ½ cup of the pasta water if the sauce seems too thick. Serve hot. I have so little motivation to cook meals that take a lot of effort. Loving this! An awsome dinner – love it! this dish looks great! I will be making this this week for sure! thanks! Hi! Just wanted to let you know I made this last night and it was the perfect weeknight dinner. Quick and delicious! Looking forward to the leftovers tonight. Great recipe!! Is the 4-6 servings for a side dish or a main course, because 8 ounces of pasta can be eaten in 1 sitting for 2 people? Hi Kazy, It’s 4-6 as a main course. 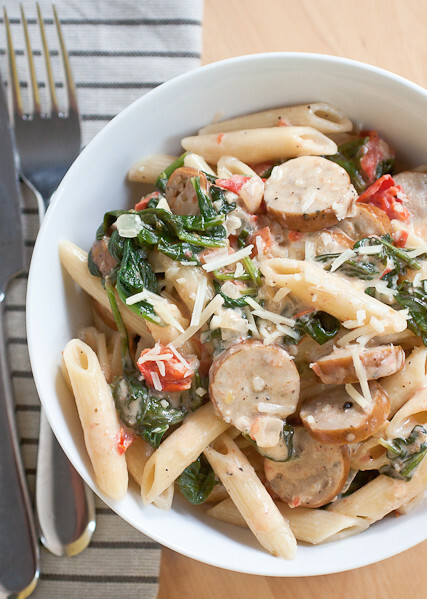 The chicken sausage, tomatoes, and spinach really help to bulk the dish up. Believe me, my husband and I could down 8oz of pasta with red sauce without blinking an eye but this one is pretty filling. If you don’t think it would be enough for 6 adults, you could also add a can of rinsed and drained white beans to the pasta when you add the tomatoes or serve some salad and/or bread on the side to round out the meal. I hope you love it and please come back to let me know how it turns out for you! Thanks, the bread idea sounds good. This came out great. I got 4 servings out of it with a little bit left over. I did change it up a bit to my own personal preference. I switched out the mascarpone cheese for ricotta cheese due to the high calories of mascarpone. I am sure it probably would have tasted orgasmic with the mascarpone, but I’m trying to keep my girlish figure <> Since mascarpone has a touch of sweetness, I added a 1/2 tsp of almond extract tot he ricotta. I also halved the amount of chicken sausage to 6 ounces and added 8 ounces of button mushrooms. I also increased the spinach. I had it with rustic bread one night and blistered edamame with chili and garlic the next night. I was very pleased and satisfied with the results and I’m putting it in my recipe files for safe keeping. Thank you, Tara, for your wonderful detailed directions. Will be back to try some more of your other goodies. Mine came out looking like a vodka sauce from the diced tomatoes in juice… did I do something wrong? Hi Genny, I think some canned tomatoes carry more juice than others so this might have been the issue. If you make this again, you may want to drain off some of the juice first. Then if you feel like the sauce is too thick at the end of the cooking time, you can add some of the pasta water to thin it out. I hope you enjoyed this even if it didn’t turn out looking like what you expected!